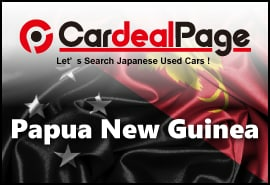 Thank you Cardeal and NIKKYO for doing business with you. Attached is the picture of me and my wife with the car. Thank you Mr Bill for feedback. And we happy to hear that you are satisfied with your purchased. We look to hear from you soon. I am thankful for the vehicle that I received from CardealPage. The car was in good shape and it looks new. I even drove 100km from the wharf and I am so proud that this car was the best for my intended purpose. If I still need cars in the future, I will still go to CardealPage for an order. Thanks to CardealPage and the workers who made this shipment come smoothly. We are very happy that you like the vehicle and we really appreciated to have done business with you. Thank you very much and enjoy your car. I purchased a Dump Truck and it was really good. Looking forward to purchase one more Dump Truck! Thank you for your time to meet our representative Mr. Jun during his business trip to Papua New Guinea. We are glad that you and your customer liked the MAZDA TITAN DUMP that we supplied you. I will look forward to do more business with you in the future. Please let us know if you need any other unit from us. 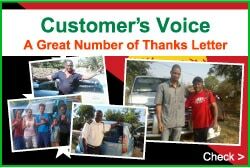 The vehicle I purchased (PRADO) was in a very good condition and is still. It has all the features I preferred and I have driven it long miles but still with stands the conditions. I recommend more deals for this company. Thank you for your time meeting with Mr. Jun during his business trip to Papua New Guinea. I believe you liked the presents he brought you; T-shirt, pen and key holder. Hope your car will serve you 5-6 years without any problem. Please let us know if you or your friends & family members need any car from Japan. We will do our best to supply an excellent condition car. Thank you for your sending wonderful Family vehicle (Nissan Liberty) to our home. We are very existing and enjoying this new vehicle around our "Kol ples" Goroka town. Next time we would like to invite you to visit Goroka when famous Goroka Show on September 16, Independence celebration. Once again, we appreciate to send us great vehicle. We are very glad to hear that you enjoy driving Nissan Liberty and to see your family with nice smiles. We promise to develop our service further more and supply quality re-condition car once again! Hello and greetings from Papua New Guinea. To be honest, I am very much impressed with the vehicles/cars or Toyota Harriers. I really admired the cars. Looking foward to continue doing business with you. Thank you for your feedback. It was nice to have done business with you this time. I am glad that you like your Harriers and hope they will serve long time. We will definitely look forward to doing business with you again.